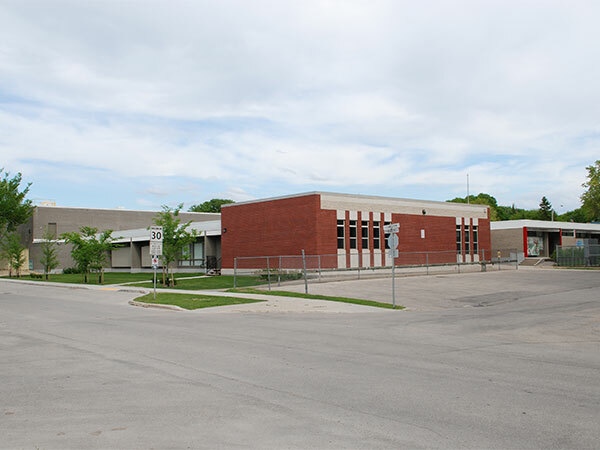 Named for Alexandre-Antonin Taché, the Tache Elementary School was built by the St. Boniface School Division in 1958, based on architectural designs of Waisman Ross and Associates. A six-classroom expansion and three-classroom-equivalent gymnasium were added in 1965 on designs of local architect Etienne J. Gaboury. Subsequent additions were made in 1971, 1972, 1981, and 2015. In January 1972, with only 178 of its 300 student capacity, the School Division sought to close the facility, citing declining birth rates and potential fiscal savings. At the time, it was the only all-French primary institution in the province. The school closed in the summer of 1974 with students transferring to Provencher School. Despite a statement by the School Division that the closure was “irreversible,” it reopened in the fall of 1976. Nine years later, students in grades 7 and 8 were transferred to Collège Louis-Riel. Now known as Ecole Tache, the school joined the Franco-Manitobaine School Division in 1994 and, in 2002, renamed its library for retiring Principal Renée-France Labossière. Among the other teachers of Tache School was Celine Thuot. “Top building designs on display here,” Winnipeg Free Press, 13 February 1959, page 9. “Tenders,” Winnipeg Free Press, 4 December 1964, page 39. “Tache School to close,” Winnipeg Free Press, 11 January 1972, page 6. “Board to keep Tache School,” Winnipeg Free Press, 26 January 1972, page 6. “Tache School struggle not over,” Winnipeg Free Press, 31 August 1974, page 15. “Citizens propose ways to renew North St. B,” Winnipeg Free Press, 12 September 1974, page 3. “Franco-Manitobaine group sees good in Tache closing,” Winnipeg Free Press, 12 September 1974, page 3. “St. Boniface School Division No. 4,” Winnipeg Free Press, 20 August 1976, page 29. “The City of Winnipeg notice of public meetings [File No. DAV 439/81 SB/SV],” Winnipeg Free Press, 7 August 1981, page 28. “Ecole Tache overcrowded, parents say,” Winnipeg Free Press, 5 November 1989, page 67.